Ipsos is one of the world’s most well-known and trusted market research companies in the world. Founded in France in 1975, it has since grown to serve almost every continent and dozens of countries around the world. Truchot was a pioneer in the advertising industry, and is hailed for having developed precise, reliable systems for measuring the success of the company’s advertising campaigns. Ipsos has relied on a number of different methods for collecting consumer data over the decades. It is famous for their consumer surveys. Ipsos created Ipsos i-Say (an updated version of an older Web survey forum) as a means of reaching directly into households via the Internet. Ipsos gathers the information that members provide on the surveys and delivers the data to sponsoring companies. Companies use this information to help them gauge how popular their products are, how recognizable their brands are, etc, as well as to develop new products for the marketplace. 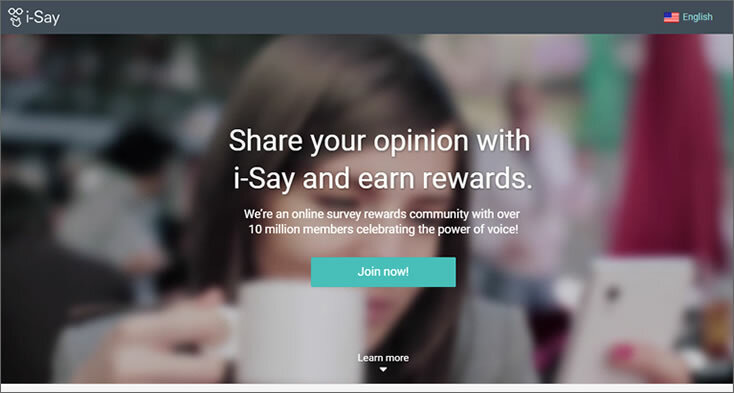 Ipsos i-Say is a consumer opinion survey Website. Ipsos has been in the market research business for decades. With the creation of Ipsos i-Say, they have been able to reach consumers more directly and on a broader spectrum than ever before. Membership is open to any person aged 18 or older and it is free to join. Initially, the only information that you will need to provide is your email address. Once you’ve requested membership, you’ll be sent a confirmation email with a link. After you have clicked the link, you’ll be asked to fill out a profile. This includes basic biographical info like your address, race, level of education, occupation, marital status, whether or not you have children living at home (particularly children under age 18), household income, etc. Some of the questions must be answered in order to become a full-fledged member. Others are optional. However, the more information that you share, the more likely you are to be offered surveys to answer and, thus, the more potential you have for earning points (more on this later ). Points can be collected and redeemed for rewards. Each point is worth a penny, so 100 points is equal to one dollar, and so on. You’ll find an assortment of rewards (listed under the “Rewards” tab, next to your points total), their value, and the number of points required to redeem them. (In other words, a five dollar gift card would cost you 500 points.) 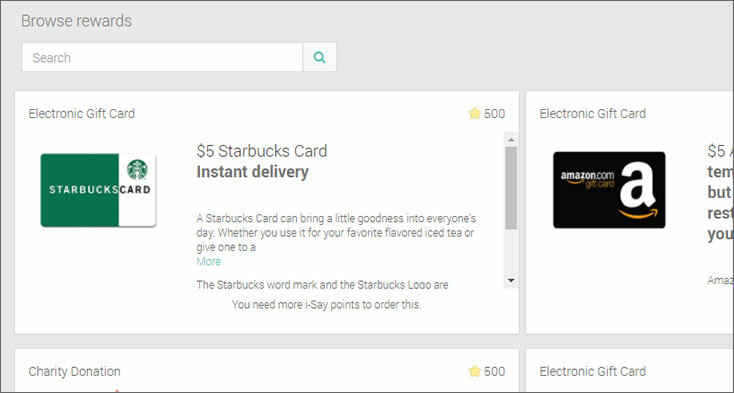 Rewards include gift cards to popular brick-and-mortar retailers and restaurants (such as Target, Wal-Mart, Bed, Bath & Beyond and Starbucks), gift cards to online marketplaces like iTunes, Amazon.com and eBay, gift cards to virtual marketplaces (like Facebook), and “as good as cash” options (like Visa prepaid cards and PayPal credit). There is also an “i-Say” marketplace with hundreds of products that you can purchase with your points. If you’re feeling charitable, you can even exchange your points for cash donations made to one of the many popular national charities partnered with Ipsos i-Say (like the American Red Cross, The American Heart Association, Habitat for Humanity and numerous others). Gift cards come in a variety of denominations (not all cards are available in the same denominations). When it comes to “as-good-as-cash” rewards like Visa prepaid cards or PayPal deposits, minimum amounts apply. (In other words, i-Say can’t drop one dollar into your PayPal account.) However, there are many rewards that start around five dollars-worth of points. 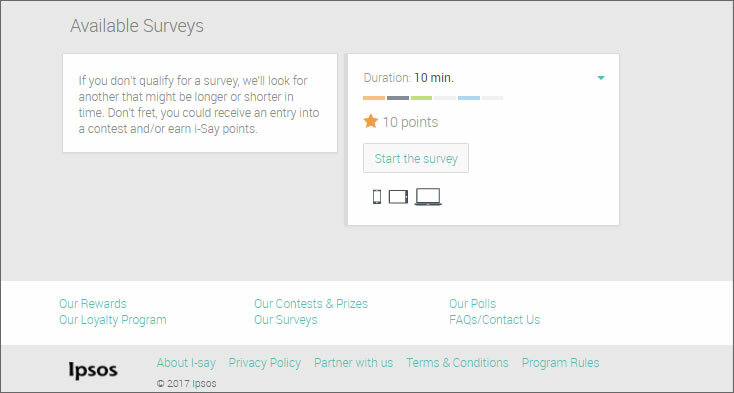 How many points are surveys worth? The amount varies, depending largely on how long Ipsos i-Say estimates that it will take the average person to complete the entire survey. In other words, the longer and more time-intensive the survey, the more points you’ll get for completing it. Every survey you’re offered will show the estimated time of completion as well as the number of points you’ll receive. For example, a 15-minute survey may be worth 35 to 45 points while a 35-minute survey can net you 100 to 150 points. You can get bonus points if you fill out a certain number of surveys within a given time frame. Although it can take awhile to get there, a freebie is a freebie. How are my rewards delivered? A majority of the gift cards are delivered to you instantly via email (egift card). Some rewards have to be mailed to you. If you choose to get a PayPal deposit, this may take several days to actually reach your account. Make sure you read the fine print attached to any reward so you’re clear on the delivery details. How do I know if I “qualify” for a particular survey? Companies who pay Ipsos for market research can’t afford to pay for opinions from an endless number of respondents, so they only offer rewards to people whose opinions re actually experience-based. In other words, if you don’t drink beer, a beer company is not going to be willing to pay for your opinion about beer. Companies want to reach people who actually use their products, or use a similar competitor’s product. This is why some people may “qualify” for a particular survey while others will not. With many GPT sites that offer surveys, you won’t really know for sure if you qualify for the survey until you actually start taking it. In fact, you might get five or ten minutes into it before finally being told that you don’t qualify, and if you don’t qualify, you get no reward for the time you already spent. Ipsos works harder than most GPT sites to offer you ONLY the surveys they believe you will qualify for. They do this with complicated computer algorithms that read the info in your profile and pick out key words. Then they match those keywords with any available surveys with the same keywords. So, if your profile says that you have three children in your household under the age of 18, and a company is looking for the opinion of parents with minor children, the algorithm will pick up on that and send you that survey offer. This is not to say that you won’t ever get disqualified from a survey you’ve already started filling out. This might still happen. However, you get consolation points for having made the attempt, something that a lot of other GPT sites don’t offer. Ipsos I Say is different from a lot of other GPT (“get-paid-to”) sites out there (i.e. 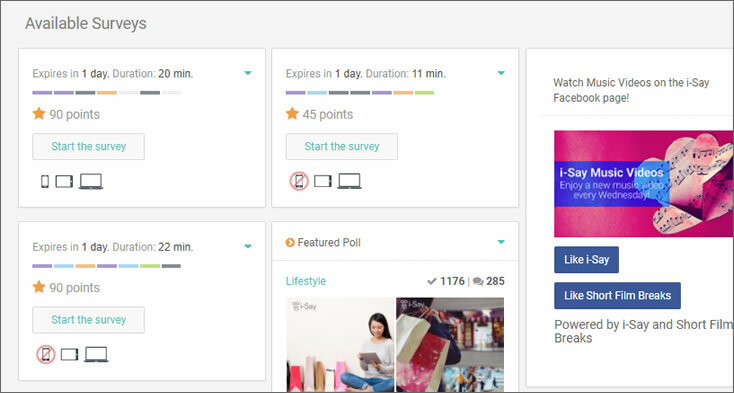 SWAGBUCKS, MYPOINTS, GRABPOINTS) in that it is dedicated entirely to surveys. Many GPT Websites, like Ipsos i-Say, offer surveys, but they also offer other options for earning points/cash (playing online video games, subscribing to email lists, downloading apps, etc.). There are pros and cons to this, which we’ll discuss in more detail in the “Our Verdict” section of this Ipsos i Say review. We checked out what real users, past and present, have said in Ipsos i Say review comments about their experiences with this site, and whether you can actually make money/earn cool rewards using it. On TrustPilot.com, a consumer review site, users are able to post an Ipsos i Say review and provide a rating out five stars regarding their experience with the paid surveys site. Overall, the company had an average of four out of five stars as designated by everyone who provided an Ipsos i Say review, although there were only six reviews in total. Said one reviewer who rated her experience five stars, “Excellent company. Always good quality and well written surveys on a variety of topics, and rewards are sent promptly (I opt for e-vouchers via email).” Another happy user stated, “I’ve tried many survey companies. Ipsos i Say has always been the best!” However, stated one user, who provided a two-star Ipsos i Say review, complained that the surveys were redundant and boring, and that it took too long to earn enough points to qualify for any of the rewards. In a three-star Ipsos i Say review, the user had mixed feelings about the site, saying that he was offered surveys regularly and enjoyed filling them out, but had recurring trouble getting his account credited once he completed them. On another consumer review Website, Sitejabber.com, eight users provided an Ipsos i Say review, and the company had an overall average rating of two out of five stars. The biggest complaint from those who gave an Ipsos i Say review on Sitejabber was that it took an inordinately long time to earn enough for even the five dollar rewards. Said one user in his Ipsos i Say review who rated his experience one star, “Earning potentials are very slow with this company. It practically took me half a year to earn $15 alone which is absolutely ridiculous.” Other, less frequent complaints, included users not having their rewards credited to their accounts after completing a survey and having their accounts shut down for no apparent reason. Yet another theme was that the site itself has a lot of glitches. We also checked with several independent Ipsos i Say review commentaries on the Web. Overall, independent reviewers seemed to point out a balance of negative and positive aspects of i Say. Many mentioned site glitches as one of the negatives, as well as the fact that it can take awhile to earn rewards. However, many also felt that Ipsos had a respectable reputation as a company and that it generally could be counted on to deliver rewards that were promised. There are a few things that stood out to us about Ipsos I Say when compared to other GPT sites. For one thing, we were struck immediately by how clean the site looks and feels. If you go to a site like GRABPOINTS or INBOX DOLLARS, you’ll notice how cluttered it looks. It’s an assault on the senses, with ads and seemingly random links everywhere. You get none of that with Ipsos i-Say, so you don’t have to worry about sketchy links putting viruses on your computer. Secondly, this site stands out from other GPT sites in the fact that it is dedicated entirely to surveys. There is, basically, no other way to make money on this site beyond filling out surveys. Therefore, if you don’t like doing surveys and would rather earn rewards playing games or watching videos, Ipsos i-Say is not going to appeal to you. On the other hand, if you like giving your opinion about products and brands, don’t care to waste your time subscribing to random email lists and are leery about downloading questionable apps to your computer or smartphone, you’ll love this site. There’s not much risk attached to it, and you won’t get strung along by the lure of earning pocketfuls money, only to find it never quite materializes. On the other hand, we couldn’t ignore the Ipsos i Say review comments from users, especially the ones that appeared multiple times, like problems with glitches (screens freezing, downloads taking too long, etc.). We also recognize that there were many users who didn’t seem to qualify for many surveys so it took a long time to earn any significant cash. They felt that it simply wasn’t worth their time and effort to bother. 1) It’s clean and uncluttered. 2) It doesn’t make any exaggerated claims about being able to make scads of money using the site. 3) It makes things clear up front so you know what to expect (like how long it will take you to complete a survey). 4) It’s Ipsos. They have a highly-respected reputation in the marketplace. 1) It seems like it’s hard to qualify for surveys. You might go for days (possibly even weeks) with no survey offers. 2) The site has annoying glitches (although perhaps they will address this with future updates). 3) It might take a long time to earn the rewards you want. In conclusion, we feel that, as long as you have realistic expectations of what you can earn from Ipsos i Say membership, it’s worth giving the site a try. It won’t hurt, and if you find that it’s simply taking too long to earn rewards or you become frustrated by other issues (like glitches) you can quit. Or you can just hang in there, keep filling out surveys when they are offered and, eventually, you’ll get enough points for a prize. See our top TWO business picks for 2019. CLICK HEREIf this is not for you, maybe learn how to become a mystery shopper. Learn how to sell products on Amazon or even become a master at Bitcoin.